Logopress Corp., the developer of SolidWorks-based Logopress3, sold in over 30 countries around the world, has spent 100% of their nearly 25 years of experience in business exclusively developing die design and flattening related software. They have been developing die design software longer than any 3D die design software developer in the world, which makes Logopress3 the 3D die design software that takes advantage of the longest user experience and feedback. Their industry-leading Logopress3 die design software is capable of designing the largest automotive-type dies as well as dies for tiny parts that have several hundred stations. Logopress3 has flawless integration with SolidWorks, with a simple and straightforward interface, which means a shorter learning curve. Logopress3 was the first product in the world to receive SolidWorks Gold Certification without requiring any changes whatsoever. One customer described the tight integration with SolidWorks by saying "If you know SolidWorks, you know 80% of Logopress3." Advanced and complete unbending and flattening functionality that can be used with a “dumb” imported model from any CAD system, even for dirty models. Strip Layout functionality that works with either solids or surfaces and can be used for progressive dies or transfer dies, or simply for quoting. Round Draw module that allows the user to create a strip layout for a round drawn part in a matter of a few minutes! Tool Structure assistant that organizes the creation of the die assembly and also helps to automate the tool & die Bill of Materials (BOM). Intelligent Standard Component Library that creates all holes at the same time as it adds the standard catalog components. Intelligent Animation and Dynamic Interference Detection to catch potential mistakes at the design stage rather than at the build stage. Automatic 2D drawing creation along with many other drawing enhancements dedicated to die design, including tool and die hole charts. Certified SolidWorks Gold Partner Product. The United States and Canada Logopress3 Technical Center (sales, training and support) and development partner is Accurate Die Design, Inc., a firm with over 55 years of combined employee experience specifically in the tool & die and metal stamping industries. Logopress3 and Accurate Die Design, Inc. were recently presented with the SolidWorks User Group Network (SWUGN) 2012 Partner of the Year award by Richard Doyle, User Community Manager for SolidWorks Corporation. Visit our web sites at www.Logopress3.com and www.AccurateDieDesign.com for more information. AutoForm offers software solutions for the die-making and sheet metalforming industries. The use of AutoForm software improves reliability in planning, reduces the number of die tryouts and tryout time, and results in higher-quality part and tool designs that can be produced with maximum confidence. In addition, press downtime and reject rates in production are substantially reduced. Based on practical, industrial knowhow and sheet metalforming expertise, AutoForm’s solutions form a complete, integrated system with highly specialized functions to analyze, review and optimize every phase of the process chain.AutoForm provides solutions all along the sheet metal forming process chain. They range from stand-alone modules for small and mid-size companies to complete, integrated multi-module systems for large companies. Due to a complete integration of all the AutoForm software modules, concepts and results from earlier phases can be easily and directly used in later phases. This enables customers to benefit from the power of simultaneous engineering, which optimizes time, cost and quality, thereby maximizing efficiency and productivity. AutoForm software is well-known for accurate results and short computation times, and for its highly intuitive user interface for reliable and practical use in design, engineering and production environments. This powerful combination of accuracy, speed and user-friendliness results in revolutionary time and cost savings, and makes AutoForm the leading software in its field. • Tooling, stamping and manufacturing engineers. For hundreds of customers, both large and small, AutoForm software provides the best total cost of ownership. It is optimized to run on standard computers with no special hardware requirements. It is compatible with all major CAD systems and can easily be used by employees across different departments and functions. Existing workforces can be trained very quickly to become productive with AutoForm software. AutoForm software is designed to seamlessly complement existing business processes without introducing any new workflow bottlenecks. All this results in highly cost-effective software solutions, which maximize productivity in the customer’s own environment. Today, more than 3000 users in more than 600 companies in 40 countries around the world trust in and rely on AutoForm for their key engineering and manufacturing operations. To learn more, visit www.autoform.com/en/products/solution-overview. Contact us at us_sales@autoform.com or call: 248-269-4000. Advanced product development engineers working as structural analysts for the world’s largest automotive manufacturers established Engineering Technology Associates, Inc. (ETA) in 1983. ETA’s expertise in the areas of vehicle durability, NVH, metal forming, crashworthiness, occupant safety and product design have provided an intimate knowledge of the challenges and needs of the product development engineer. Proactive in the creation and implementation of new analysis methods and software, ETA is also the developer of the Inventium Suite, an enterprise product development solution with finite element modeling and system analysis capability. For more information, please visit www.eta.com, email or call (248) 729-3010. ETA, the developer of eta/Dynaform, recently announced the release of Version 5.9. eta/Dynaform is a die system simulation software solution that allows organizations to bypass soft tooling, reducing overall tryout time, lowering costs, increasing productivity and providing complete confidence in die system design. It also allows for the evaluation of alternative and unconventional designs and materials. By simulating every detail during the design stage, eta/Dynaform ensures the highest quality formed part and most efficient manufacturing process possible. A new module, which incorporates optimization, was unveiled in this new release. The Optimization Platform (OP) makes eta/Dynaform the most complete and powerful solution on the market for die system simulation and optimization. ETA has embedded Red Cedar’s optimization technology, Sherpa, into the OP module. The module is focused on supporting optimization of drawbead forces along with binder pressure, lubrication, gage and material. Using the newest optimization technology, the OP module reduces product development time and cost for manufacturing by reducing incidents of wrinkling, thinning and tearing with limited effort. The OP guided user interface makes optimization viable for a larger set of users, since special optimization expertise is not required. Additionally, the latest computing platforms combined with an efficient solver eliminate demanding computing requirements. The solver is an incremental solution (INCSolver) that delivers exceptional speed, taking advantage of Shared Memory Processing (SMP) computing technology on multiple core machines running Windows 7 and beyond. This solution will allow quick and accurate optimization of die face design, saving critical product development time. For many years, tooling engineers have used DYNAFORM as a virtual tryout for metal stamping. Now, engineers can go beyond identifying problem areas by incorporating design optimization to improve performance and quality - removing wrinkles and cracks. BSE is widely used for estimating blank size, along with blank nesting for maximum material usage, scrap and piece price. The plug-in is used to predict thinning, thickening and also to generate a forming limit diagram (FLD). FS facilitates the rapid development and validation of single-station and progressive die designs. It uncovers hidden problem areas and enables designers to optimize designs based on accurate forming results. 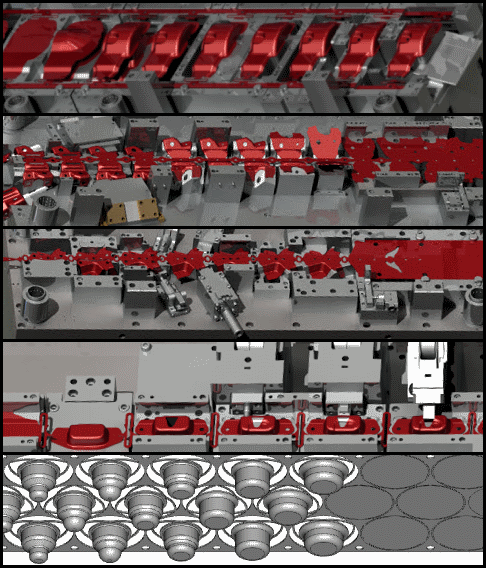 DSA efficiently predicts many stamping related concerns within the die production line. It is used to analyze scrap shedding/removal, die structural integrity and sheetmetal transferring/handling. For more information, please visit www.eta.com/dynaform. TST Tooling Software Technology is known for its innovative cutting edge CAD/CAM/CAE software, support services, and Tool Shop Tracking software for the Tooling and Production industries. TST is the North American Master Distributor for VISI and PEPS, and also sells and supports Edgecam and other CAD/CAM/CAE software. Contact us at: sales@tst-software.com to learn more about what TST and VISI can do for you. Click here if you are interested in sponsoring this event. Contact Brad Kuvin, bkuvin@pma.org, with questions about sponsoring the Die-Design Software and Simulation-Technology Experience.